Moms of teenagers do not like being in the passenger seat when our beloved Planet Teenage Boy (PTB) citizen is driving and decides that he “has” to cut someone off. If you are a mom with a PTB/PTG citizen and feel I am taking liberties with this statement, please feel free to express your willingness to get yourself killed by teenage offspring in the comments. I will update this post as necessary. I am still unsettled about my helpless position during my brush with death this morning on the way to school. Helpless beyond the screaming and yelling at the top of my lungs, that is, but I remain confident my input was somewhat effective if only to equally scare the bejeebers out of my Newly-Licensed Teenage Boy in the moment. Of course, my PTB Citizen found the nastiest old guy (yeah, I know, who’s talkin) with the shortest temper on Earth to cut off. Thus we had war between the Old Guys and the Teenage Boys occur on our normally peaceful roads this morning, with me and all of my Mom-ness literally a captive audience. Let’s see, first OG flipped off TB, which TB found shocking, then OG chased us down, cut us off and tried the I’ll-teach-you-a-lesson-by-suddenly-slamming-on-my-brakes-in-front-of-you thing twice, allowing TB to show off his “skills” by swerving and testing the limits of our Minivan’s Antilock Braking System. Fittingly, OG’s license plate proudly states he is a “Dad,” and I must say the maturity level verified it. While I’m exceedingly grateful that OG’s wife didn’t let him pack the gun this morning, the whole flipping/chasing/lesson-teaching thing was not an effective example of mature conflict resolution skills for my citizen of Planet Teenage Boy. “Whoa, that guy has a temper!” was foremost in our debriefing. I know, I’m a day off on the Post A Day thing, so sue me. 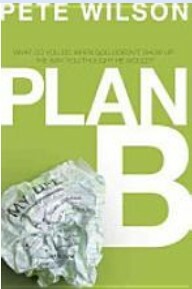 “Plan B: What Do You Do When God Doesn’t Show Up the Way You Thought He Would? by Pete Wilson (no, not that one, another one) changed my life because it challenged the idea that somehow we are “suppose” to have easy carefree lives without any troubles, mean people, tragedies or conflicts. While most of us will say we don’t expect life to be perfect, I don’t see a long line of people to sign up for the hard stuff. We don’t deserve exclusive blessings, nor do we deserve a certain quota of tragedies. Why do babies die? I Don’t Know. If I knew everything, I wouldn’t be sitting around blogging. We are simplistic beings, like 2 yr olds whining because they can’t have a cookie, or worse, because they have to eat vegetables. 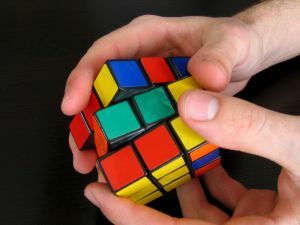 However, God is more like a Rubik’s Cube Kind of God– there’s a lot of complicated stuff that affects other people which affects other people, and so on. Did I want to be in a major car crash with a permanent injury so that my friend could mention the name of Jesus in a country hostile to Christians because he was only repeating what one of those “American people” had told him? Glad it blessed somebody in some other country where it’s way harder to survive than my struggle not to drive across the street to get a soda, but I still really hated physical therapy. This book taught me to stop fighting what’s actually happening and let Someone who actually has a clue about managing the universe handle it. Stuff is gonna happen. Usually it does. Be ready for the “Plan B” and recognize that just because you feel out of control doesn’t mean He is out of control.